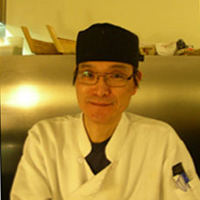 Koji was born in Fukushima, Japan where he pursued his culinary journey by working at various hotel restaurants in Japan until he immigrated to Canada in 1986 with his family. Here he continued to work at various Japanese restaurants, beginning in Ottawa before finally settling down in Niagara Falls. Throughout his culinary career, he has developed his own unique methods in preparing authentic Japanese flavours with a Western inspiration. With over 30 years of experience handling fish, he uses only the finest ingredients available and adds a seasoned flair to all his seafood dishes. Now a proud owner and executive chef of his own restaurant, Koji invites you to share a memorable dining experience. Koji and the team at Michinoku Japanese Restaurant in Niagara Falls, Ontario welcomes you to call or visit us today to sample our exquisite menu selections.